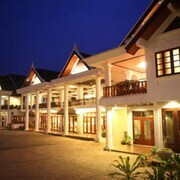 A stay at Kiridara Hotel places you in the heart of Luang Prabang, convenient to Phu Si and Wat Mai. This 4-star hotel is within close proximity of Kuang Si Falls and Night Market. Relax at the full-service spa, where you can enjoy massages and body treatments. You can take advantage of recreational amenities such as an outdoor pool, a spa tub, and a fitness center. Additional features at this hotel include complimentary wireless Internet access, concierge services, and babysitting/childcare (surcharge). Getting to nearby attractions is a breeze with the complimentary area shuttle that operates within 1.50 km.